Why wait until we are adults before learning how to manage stress? This page offers a few basic stress management techniques that can be incorporated into your physical education curriculum. The Relaxation & Stress Reduction Workbook. Eshelman, E.R. & McKay, M. (2008). Take a deep sigh, letting out a sound of deep relief. Smile when you feel tension coming on. Make the situation as fun as you can. Neck Movements: Stand with feet shoulder width apart, move the head in the following ways: up & down; side to side; and bend ear toward shoulder. Inhale for the first half of the movement, exhale for the last half of the movement. Match the length of the movement to the length of your breath. Shoulder Movements: Stand with feet shoulder width apart, move the shoulders in the following ways: up & down; forward & back; and in circles. Inhale for the first half of the movement, exhale for the last half of the movement. Match the length of the movement to the length of your breath. Vertical Trunk Twisting: Stand with feet shoulder width apart, twisting side to side, arms relaxed at sides gently swinging. Continue for several seconds.Stand with feet shoulder width apart, hands on head, elbows out, twisting slowly and exhaling to the right, inhaling and twisting to the center. Repeat on left side. Match the length of the movement to the length of your breath Repeat several times. Walking: Walk mindfully, paying attention to how it feels when your heal touches the ground, and then the middle of the bottom of the foot, and then the toes, and so on. Pay attention to each tiny movement. See how slow you can walk. See how many tiny parts of the movement you can pay attention to. Alternatively, see if you can coordinate your breathing with your walking. For example, see if you can inhale while stepping to with the right and exhale while stepping with the left. Abdominal or diaphragmatic breathing is our natural way of breathing, just look at the way babies breathe! Unfortunately as we grow older, stress along with other factors contribute to a more unnatural breathing pattern through our chest, which can often be shallow, rapid, or irregular. Diaphragmatic breathing is a quick and easy way to elicit relaxation and relieve stress. See the basic instructions below. Step 1: Get in a comfortable lying position. Step 2: Assess your current breathing pattern by placing one hand on your chest and one hand on your abdomen. Step 3: Focus on breathing through your abdomen, paying attention to the breath and rise and fall of your stomach (inhale through the nose and exhale out of the mouth). It is okay if your mind wanders, just return to focusing on your breathing when you become aware. You can use pre-made scripts, your own script that is specific to your students, or websites/apps such as Calm.com, Mindfullness for Teens, and Smiling Mind. Pre-assess imagery skill using a Sport Imagery Questionnaire. Practice in settings with little to no distractions. Use vivid and controllable images. Include both the execution and end result of skills. ​Progressive Muscle Relaxation (PMR) is a technique used to make the participant aware of which muscles are carrying tension. The process involves tensing a muscle group for a short time, relaxing the muscle group, and focusing on those sensations. Not only does this technique help relax muscles but it also makes the people aware of where they carry their stress. Listen to the script in the video for an example. 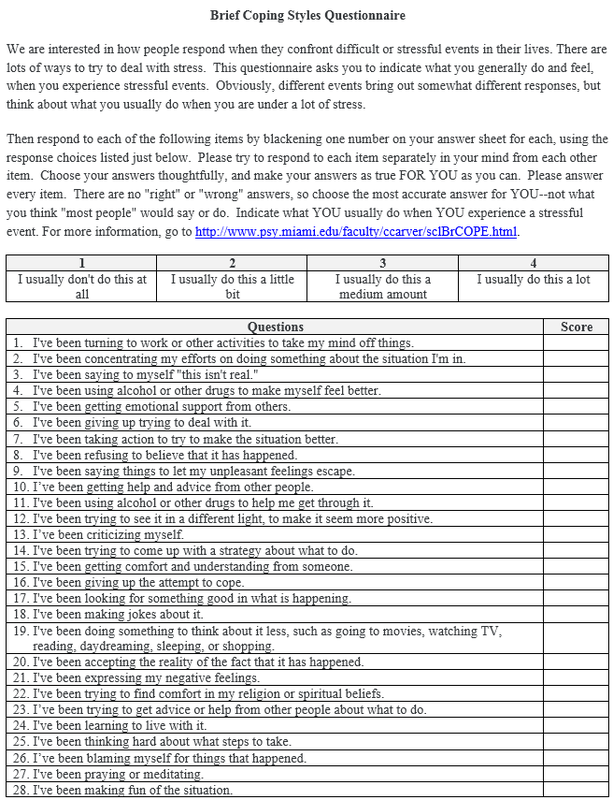 Use this questionnaire to assess your students' coping ​styles. Click Here for More Information and Click Here to Download the Document. 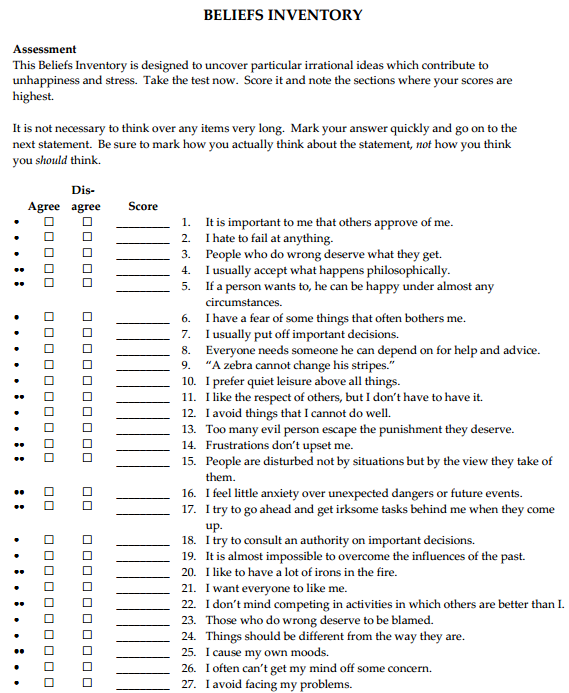 Use this questionnaire to assess any "irrational beliefs" your students may hold. ​Click Here to Download the Document.